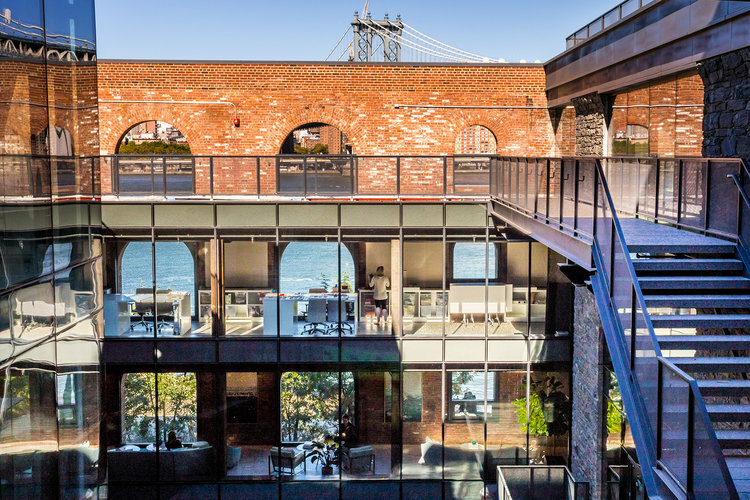 Business owners looking for office space in Brooklyn should consider working out of DUMBO. The neighborhood initially served as a ferry landing and was marked with industrial and warehouse buildings but has grown to house a variety of businesses—startups and more established businesses alike. Without further ado, here are four reasons DUMBO is a prime neighborhood to focus on when searching for office space in New York. Likely the first question you ask about any given office space is, “Where is it?” Even the most spacious office space with the best amenities becomes vastly less attractive if it’s not situated in a good area. DUMBO borders Brooklyn Bridge Park to the north, the Brooklyn Bridge to the west, Brooklyn Heights to the south, and Vinegar Hill to the east. Nearby neighborhoods include Vinegar Hill, Navy Yard, Downtown Brooklyn, and Waterfront. Several factors make DUMBO an ideal setting for your growing company. It’s conveniently located near Manhattan: DUMBO office space renters enjoy the best of both worlds: the rich, lively Brooklyn atmosphere and easy access to the borough of Manhattan. Visiting customers or making business connections across the East River could not be easier; just take the ferry or use one of the bridges. DUMBO is divided into two sections. One of them lies between the Manhattan and Brooklyn Bridges, and another stretches between the Manhattan Bridge to Vinegar Hill. It’s near the up-and-coming Navy Yard: DUMBO is a relatively established neighborhood with a solid reputation as a place for thriving business. While stability is attractive, raw potential affords countless possibilities, especially for startups. Enter Navy Yard, DUMBO’s neighbor and one of Brooklyn’s most promising budding neighborhoods. It used to be a Navy Base, but investors have put more than $900 million into its revitalization, and now it’s becoming a popular place to live and work. It has many transportation options: Office location obviously impacts commute times. DUMBO offers a wide range of transportation options, especially trains. Commuters can most easily take the A, C, or F trains; trains 2, 3, 4, 5, and R are also nearby. The area is also well-suited for pedestrians and features many CitiBike docks for those who prefer to get around on two wheels. DUMBO is unique because it’s equally attractive to both larger companies and startups. It houses plenty of big-name companies but also features a creative melting pot for new ideas and ventures. Big-name tenants and new space: Potential renters will find more than 3 million square feet of office space in DUMBO with about a 17% vacancy rate. It features the Dumbo Heights office complex and has the leading Brick & Beam inventory. Significant development projects are underway as well. All these rental options have already attractive 25 percent of NYC-based tech firms that employ more than 10,000 people. Dumbo, which is considered the center of the Brooklyn Tech Triangle, is home to Etsy, West Elm, Amplify, Big Spaceship, Red Antler, and Gothamist. Startups and their spaces: Besides the existing and in-the-works office complexes intended for larger companies, DUMBO also features an impressive network of coworking spaces and incubators for startups; incubators include the DUMBO Startup Lab, Green Des, and The NYU-Poly DUMBO incubator. DUMBO is short for “Down Under the Manhattan Bridge Overpass”; this naming phenomenon is known as portmanteaus, or a linguistic blend of words. Other NYC neighborhoods are named this way, too, such as Brooklyn’s BoCoCa and Manhattan’s SoHo and NoHo. DUMBO isn’t just a bland division of cookie-cutter office buildings and nothing else of interest. Instead, it’s full of beautiful views, cobblestone streets, interesting shops, and high-rise apartments. Your direct reports will love living and/or working in this bustling neighborhood. Here are just a few of its important features: food, coffee, and opportunities to build community. Gran Electrica: This Mexican restaurant offers affordable prices, a light atmosphere, and a beautiful location near Brooklyn Bridge Park. Cecconi’s Dumbo: If you like eating on the waterfront, put on your fancy clothes and get ready to sit in velvet chairs and eat pasta or enjoy happy hour. Sugarcane Raw Bar & Grill: This restaurant is a crowd-pleaser that offers everything from “lobster BLT” sushi rolls to roast chicken. The over-the-top decorations and noticeably polite staff will add to the experience. Coffee shops: In order to stay in business, companies need money, excellent employees, and a product or service that people want—but they also need coffee. Dumbo provides plenty of unique coffee options beyond Starbucks. Smile to Go: This is a good spot if you want a cup of coffee along with a snack or a sandwich. Just stop by, get it to go, and take a walk by the water. Brooklyn Roasting Company: This hipster shop’s coffee is as unique as its atmosphere. Stop by and get your caffeine fix while enjoying its welcoming vibe. Matchaful Cafe: Though this pop-up cafe can be pricey, it offers a wide variety of drink choices. Coffee connoisseurs will enjoy trying something new at Matchaful Cafe. Brooklyn Bridge Park: Those looking for proof of DUMBO’s beauty, thriving community, and successful combination of work and play need to look no further than Brooklyn Bridge Park. It not only serves the community with its ferry landings but also provides beautiful spaces for sports, biking, walks, and just relaxing observation of the waterfront. The park also helps build community with its many event offerings such as movies, fitness groups, and music. DUMBO can’t really be called up-and-coming anymore. Though it’s still growing and changing, it’s made great strides to be a great place to live and work. Learning about DUMBO’s rich historical background can help assure office space seekers that the neighborhood has been heading in the right direction for a long time. The area used to be known as Gairsville because Robert Gair became famous in the area for inventing the cardboard box. DUMBO began as a ferry landing dotted with 19th- and early 20th century industrial and warehouse buildings. When Two Trees Management owner David Walentas bought the area in the 20th century, he made DUMBO into a residential community, where mostly students and artists began to live. It morphed into a commercial community that became a popular location for technology startups. Those interested in DUMBO history should venture to the DUMBO Historic District, which was added to the National Register of Historic Places in 2000. If you decide DUMBO is the right place for your business, it’s time to start looking at available office spaces. Maybe you’re weighing the pros and cons of leasing vs. subleasing or trying to decide which neighborhood is best for you. One of our experienced brokers would be happy to answer all your questions and help determine the best options for you and your company.